The First Aid training at Work statutory course complies with the current Health and Safety ( First Aid ) Regulations. A first aider is someone who has undergone a training course in administering first aid at work and holds a current first aid at work certificate. 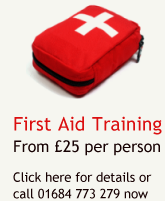 We will deliver first aid training at your venue at a time to suit your needs.